A screenshot of El Jefe from the Center for Biological Diversity and Project CATalyst’s new video. This is one of the most exciting stories I have yet shared on this blog. 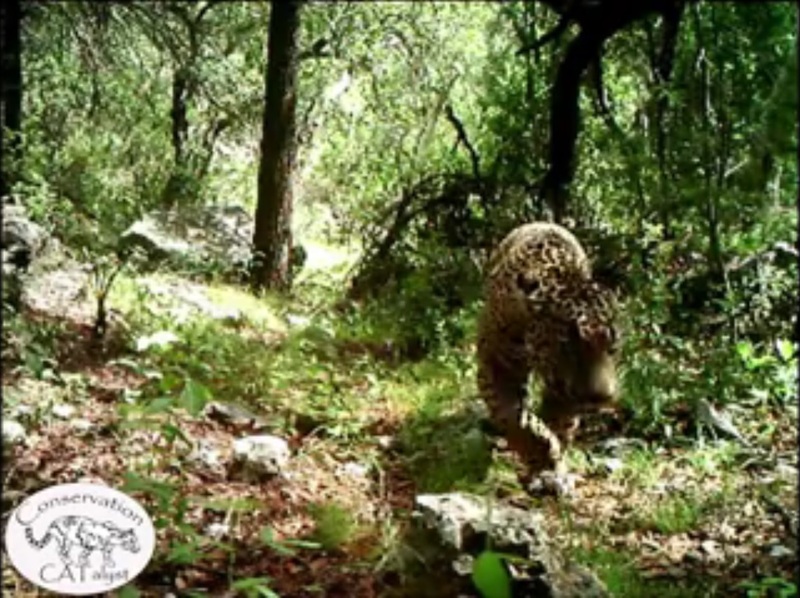 El Jefe, the jaguar who resides in Arizona, has been videotaped. And now the Center for Biological Diversity has shared the video on Facebook! This video is the product of years of hard work by the Center for Biological Diversity and Conservation CATalyst. They have just released it today, and they chose a perfect time to do so. Even though El Jefe lives in federally designated critical habitat for his species, a Canadian company wants to develop a massive copper mine in his home. According to this press release from the Center for Biological Diversity, this mine would be a major roadblock for jaguar recovery in the United States. In order to protect El Jefe’s home, the Center has started an online petition. By signing it, you will be taking a stand for this beautiful jaguar by telling the United States Fish and Wildlife Service that you are opposed to the Rosemont Mine. Please visit this site and sign this important petition. To view the first ever video footage of El Jefe, click here. Pingback: Jaguar Videotaped in the United States!!! | Blogger's World! What a beauty he is. I hope he isn’t alone and has a few other jaguars to give him company. Being rare can make life very lonely. He certainly is a beauty! El Jefe is the only jaguar in the US that we have undeniable proof of, but there’s always a chance that there could be more. Even if there aren’t, there’s a breeding population not too far to the south in Mexico. So far it’s thought that all the jaguars seen in the US in the past two decades came from there, so more might be on the way. I hope so. I’d love him to get a lady jaguar he can spend his life with, and rear a family if he wants to. We need more of his kind, if we don’t want the world to be run over by humans. Oh man, if a female jaguar turned up that would change everything. And if they started breeding…that would be some of the biggest conservation news for the US in decades. Fingers crossed for that. I hope the most glamorous lady jaguar of all crosses the Mexican border and arrives in Arizona. I am sure our cowboy won’t be able resist her charms. An amazing watch and read about El Jefe – the only known wild jaguar in US. Thanks for sharing this Josh. Please visit original blog. Comments diabled here. Featured under ‘From Around the World’. I’ve never made it to Vancouver Island, but I spent a year in Seattle. The whole Pacific Northwest region is beautiful…if a little cloudy. I agree that letting even one species slip away is too many, but unfortunately in the US we actively pushed the jaguar to extinction. But now they’re trying to make a comeback. Hopefully the copper mine (and border wall) won’t prevent them from returning. What a magnificent creature. Thank you so much for sharing this Josh. You’re most welcome! It’s good to know that despite massive changes to southwest US ecosystems, at least one jaguar still finds the area suitable. This was a nice read about El Jefe and the video was great, such a nice looking Jaguar. Thanks for sharing, I definitely glad I signed petition to keep him safe, he deserves to live in his nice lovely home. Thanks for signing the petition, and for your enthusiasm about El Jefe! Protecting his home goes beyond just keeping El Jefe safe: it means that any other jaguars who might enter Arizona will have a safe haven. All the other animals who live in the jaguar critical habitat will benefit too.